Over the course of a lifetime, your teeth can take quite a beating. Obviously, the ravages of coffee and red wine take their toll on the pristine whiteness of the teeth, turning them yellow over time, but potential aesthetic problems extend beyond coloration. Teeth can also become chipped or worn down, shift alignment, develop pock marks and grooves, or even separate and create gaps. These defects, while natural over the course of time, can drastically reduce your confidence in your own appearance. In these instances, simple tooth whitening isn’t enough to restore a healthy smile. Whitening only changes the color, not the actual size and shape of the tooth. In these instances, a more intensive treatment is required. Dental veneers, also known as laminates or porcelain veneers, were designed to fix that very problem. These incredibly thin shells of tooth-colored resin or porcelain are custom designed to affix directly to the front of the teeth. 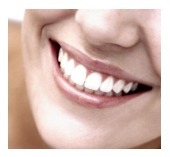 Veneers allow the dentist to completely cover the teeth with a freshly created and impeccably colored exterior. By bonding them to each individual teeth, it gives the dentist the control necessary to change the appearance of the entire tooth, from length and size to shape and color. The process begins with a consultation in which a LA Dental Town dentist will examine your teeth and determine whether veneers are the right solution for you, making sure to go over the whole process to your satisfaction. Following that, the dentist will prepare the teeth by removing a very small portion of the enamel and then taking impressions of the teeth. The veneers will be fabricated separately in a dental laboratory, and then an appointment will be scheduled for the dentist to bond the veneer directly to the prepared surface. After the cosmetic dentist has done their work and the procedure has been completed, you will be left with an immaculate, shining set of teeth. The teeth in question will be perfectly shaped, and you will leave the office able to smile as widely as you please without worrying about your teeth’s appearance. For more information on how the LA Dental Town team can reshape your smile, contact our offices and schedule your consultation today.